WordPress is a hugely popular content management system that is used by tiny blogs and multinational companies alike. No matter how big or small your website, one of the things that will be of concern to you is improving your lead generation efforts. Fortunately, WordPress comes with a huge number of excellent plugins that help you to boost your lead generation and conversion efforts. Landing pages are a key tool for any internet marketer. When you want to convert visitors, it’s often a great idea to send them to a dedicated page where you can then focus on getting them to take one specific action, whether that is calling your number, filling out a form or making a purchase. 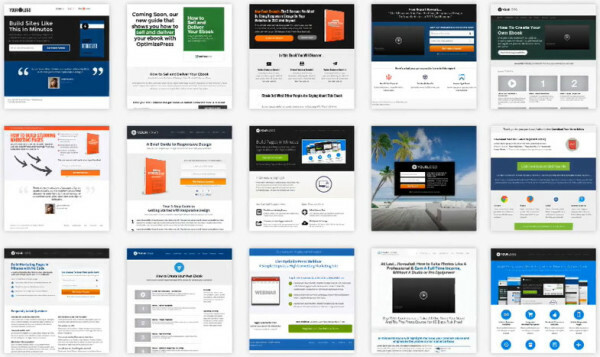 Here are some great plugins/tools to help you build landing pages that convert. 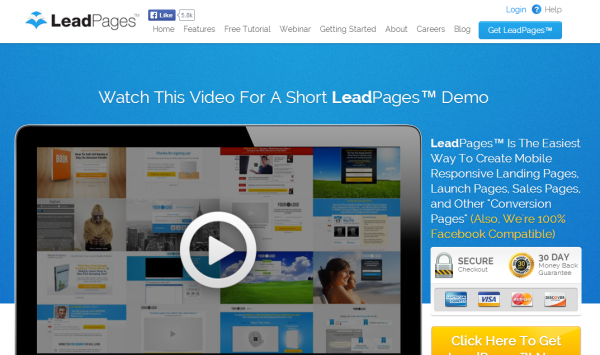 Leadpages is another very useful plugin that can help you to build up your email list when you are generating leads. This plugin essentially provides a range of services to streamline the whole lead-generation process, making it a simple and very useful way to increase your leads. You can use the plugin to create unlimited landing pages, email subscription forms and thank-you pages. The whole process of designing landing pages is made easy, and you can set them up in a matter of minutes. This is a premium plugin so you will have to pay for it, but it could be an excellent option if you want a complete solution to setting up landing pages and email forms using just one plugin. Leadpages integrates with many 3rd party analytics tools, and also has the ability to track conversions natively in the Leadpages dashboard. 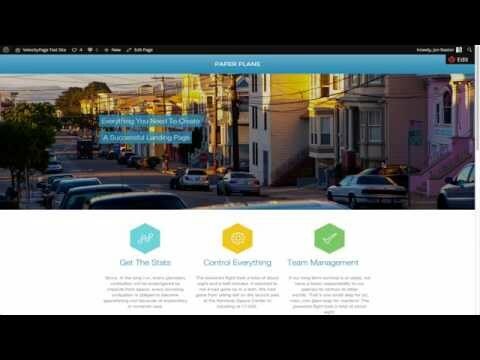 This is one of the best landing page builders for WordPress. If you want a plugin that will make adding landing pages simple and hassle free, this could be one of the best options. It uses drag-and-drop editing so you don’t need to have any design or coding skills to make use of it, and you can simply use the tools available to create stunning landing pages with ease. There is no need to waste time going from the editing mode to the viewing mode because you can see how your pages look as you are creating them. You do not have to waste lots of time learning many new things because it is all designed to be as straightforward as possible. It comes with many templates so that you can choose a page that is ready to publish. However, you do not have to stick to templates, and instead you can create any page that you want to from scratch. The plugin works with nearly all WordPress themes, and it is compatible with third-party apps like Aweber. 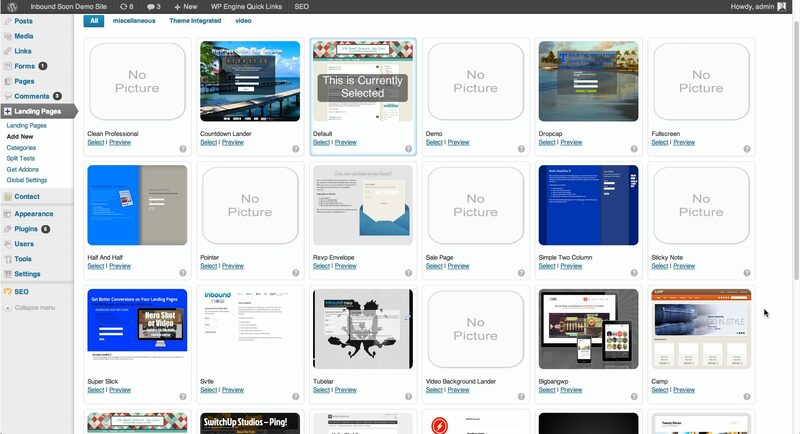 Great free plugin from the guys at Inbound Now. This plugin is packed full of features with extra extensions for lead capture. 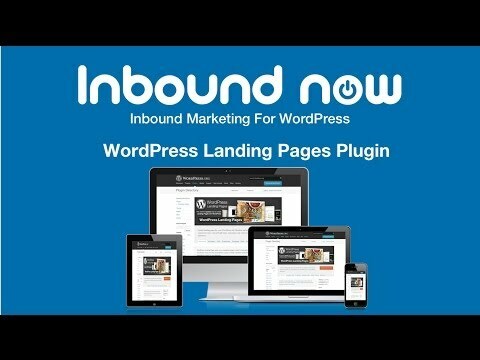 WordPress Landing Pages is one of the best plugins for any marketers who are serious about their landing pages. One of the biggest problems with landing pages is creating them, and this plugin makes it easy to do so. There is no need to have any knowledge of web design, and you can simply use the tools provided by the plugin to design the pages from scratch with ease. The visual editor is a very effective tool for helping you to design your pages and it makes the whole process easy. Once you have set up your landing page, you can carry out both A/B split testing and multivariate testing to test different versions of the page and find out what is working. You can then use the results that you get and track the conversion rates to maximise your lead generation. 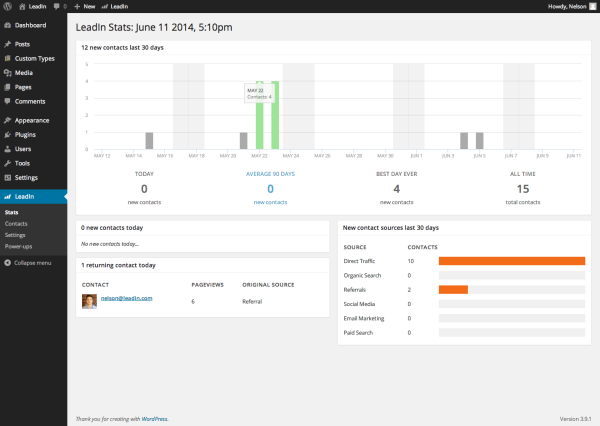 Inboundnow lets you integrate their tool with lots if different 3rd party tools. This is another excellent plugin that you can use to create landing pages that convert more visitors into customers. You can use it to quickly create sales pages, membership portals, authority blogs, marketing pages, product launch funnels and more in addition to the landing pages, making this a great option for creating a wide range of pages. You can build and edit pages in real time, which allows you to see all the changes as you make them, which makes the whole process easy to do. There are also numerous templates available to choose from, and the plugin integrates with a wide range of third-party apps. The pages are all responsive and so look great on mobile devices. You may not require a plugin that allows you to test every element of your page, and instead you may want to use something simpler. If so, this plugin could be a good option because it simply focuses on experimenting with the titles of your pages and blog posts. As you probably know already, many readers will only decide to read your article if they are attracted by the headline. However, choosing the best headline is not always easy. Instead, use this plugin to test a number of different headlines and find out which one attracts the most visitors. You can then use what you learn to create even more compelling headlines for your future articles to ensure you get as many people as possible viewing your web pages. It would be a shame to create all that fantastic content only for people to ignore it because the headline does not capture their attention, so this plugin could help you to increase visitors to your site and improve engagement. Kingsumo, by Noah Kagan is a paid version of the above tool. Kingsumo will actually automatically test all the headlines you throw in and continue to publish the titles that get the most click throughs. Although it takes a little bit of effort to set this up, Google Website Optimizer for WordPress can be well worth it. The way this plugin works is by integrating the Google Website Optimizer into your blog posts and pages on your website. You can then very easily test your website copy and headlines using these tracking codes to find out which versions perform best to generate conversions. Testing is always essential when it comes to improving your conversions, and this plugin makes it easier to do so. Use it to find out what is working on your website, and then improve it. This is one of the best ways to find out more about what works on your site so that you can provide your visitors with what they want and make more conversions. A/B split testing is one of the most effective ways to improve your web pages to optimise them for conversions. However, many people think that the process is too complicated to do on their own. 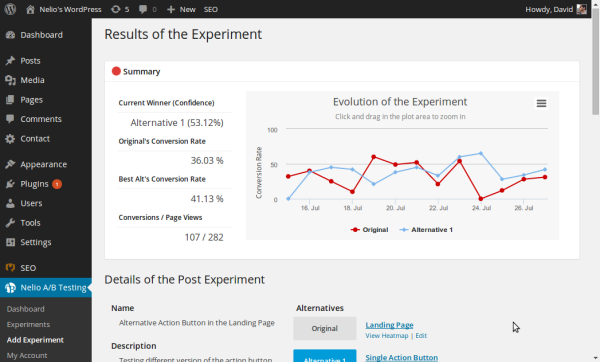 This plugin makes it easy so that now anyone can use A/B split testing to improve their sites. The aim of this plugin is to help you increase conversions. 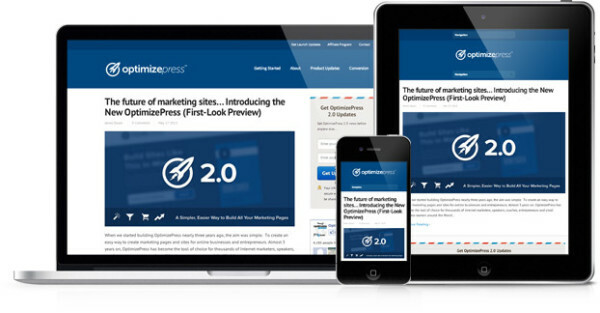 AB Press Optimizer makes it quick and easy to create a wide variety of pages with different elements including images, forms headlines, content and more, and you can then start testing them immediately. 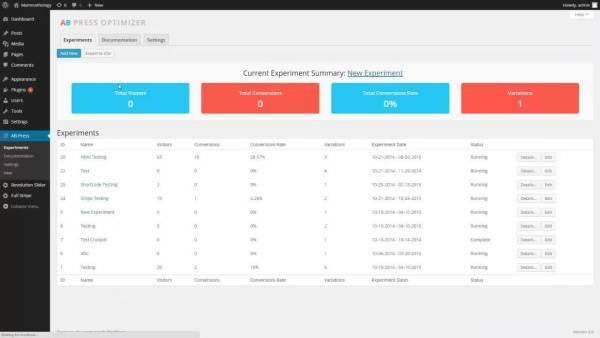 There is no limit on the number of experiments you can do using the plugin, and you can also get real-time updates on your experiments. 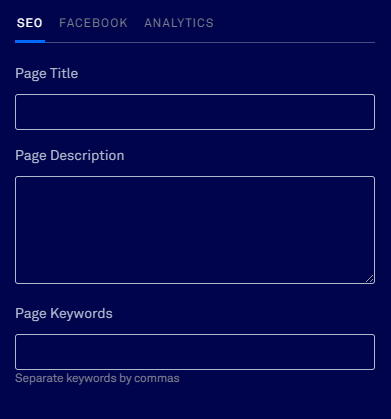 You can test any element of the page, post and theme that you want to, and it is incredibly easy to set up your experiments and see the results. There are also no limits on monthly visitors. This is one of the best A/B testing plugins available, but you have to subscribe to it and pay a monthly fee. There are different plans available for personal sites, business, etc, so choose the plan that works best for you. Using the plugin, you can test pages, widgets, themes, posts and essentially anything else on your website to increase interactions and engagement. It also has an automated feature so you can update your site automatically when one version gets better results. You do not need to have any coding skills or design skills to start your experiments, and the whole thing is designed to be as easy to use as possible. You can even control everything from the dashboard so you never have to leave WordPress, and you can get results from your experiments immediately. For lead generation, few plugins can beat OptinMonster. Although it has not been around for a huge amount of time, you can use it to take advantage of numerous options for boosting your lead-generation efforts through a variety of popups. Its key feature it that it makes it easy for you to create popups and opt-in forms so that you can boost the number of subscribers through your website. You may want to create a standard popup to appear when someone lands on your site, a widget that appears at the end of your blog posts, a form that appears as a visitor is about to leave your website, or a bar that appears at the foot of the page. Customisations are easy to do, and you can even use it to set up an A/B split testing system to find out what is working best and optimise your site further. And you can also integrate it with Aweber and other services to tie in with your email marketing activities. One of the most important tools that you will need on your website if you want to boost your lead generation efforts is a contact form. There are many form plugins available on WordPress, and choosing the best one for you can often be a challenge. However, Gravity Forms is a great place to start and it is one of the most popular form plugins available. 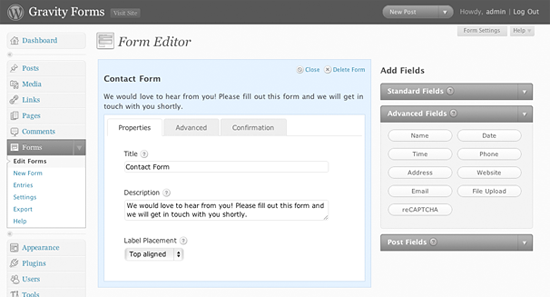 You can use the plugin to build new forms quickly and easily using a very simple form editor. Simply choose the fields you want to include in your form and make use of options such as breaking the forms up into pages. You can use forms as contact forms, order forms, to provide product details and even to enable visitors to make purchases directly from your site. You can also embed the forms with ease wherever you want to on your website. 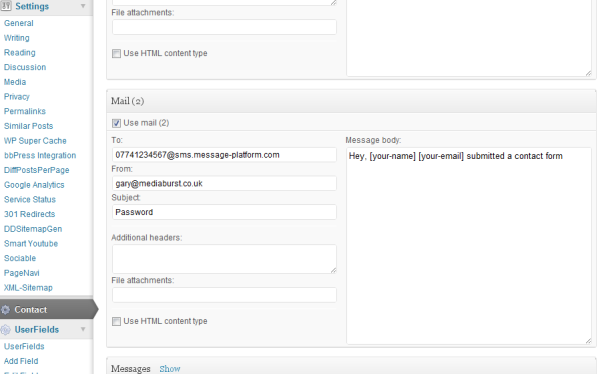 In addition, you can use Gravity Forms to integrate with email marketing platforms like MailChimp. This allows you to capture information on your website with ease, and you can even set it up to send automatic email replies when a form is filled in. It is a great way to automate your processes, especially if you are providing a free ebook or report in return for signing up to your email list. If you don’t require the power of Gravity Forms, you could opt for a simpler plugin like Contact Form 7. This is another very popular plugin that provides a wide range of customisation options so you can create the forms you need to enable visitors to get in touch. It is very simple and easy to set up, and it also makes use of CAPTCHAs to get rid of spam. Popups are a classic way to convert traffic that lands on your website. The danger with popups is that some visitors may find them annoying, but this risk can be minimised by using an effective plugin that provides you with a wide range of customisation options. The fact is that popups can be highly effective when it comes to generating leads as long as you use them properly. Using Ninja Popups, you can choose from a wide selection of pre-designed popups on your site, or you can use the tools provided to design your own. You can then choose which pages you want the popups to show up on, and you can also manage a number of different popups at the same time. There are plenty of customisation options available in the plugin so that you can create the popups exactly as you want them to appear, and analytics are also built into the plugin, all of which can help you to improve your conversion rates. If popups are still a bit too intrusive for your website, you may want to try out the Scroll Triggered Boxes plugin. Some webmasters worry that they will turn visitors off by using popups as soon as they land on the site, and this provides a less intrusive way to take advantage of the power of popups. Instead of displaying a popup as soon as the visitor lands, you can set it to appear once the visitor has scrolled down a certain amount of the page. By this time they are likely to be more engaged with your content, and the popup is less likely to annoy them. It could even improve the chances that they will sign up to your email list, giving your lead generation a boost. Whether you want to encourage them to sign up to your newsletter, to fill in a contact form or anything else, this can be a very useful plugin. 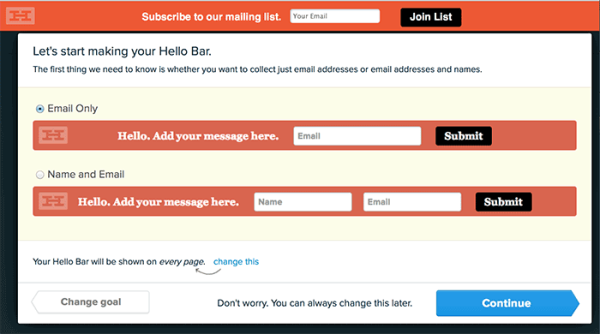 The Hello Bar plugin is a very simple idea that can also turn out to be very effective. This small bar simply sits on the top of your website, and you can add some text and a button to it. When visitors click on the button, they will be directed to the landing page of your choice, where you can attempt to convert them. It is very simple to install and use, and it is a great way to direct people to your landing pages as soon as they land on your home page. Sometimes it really is the simplest things that work the best, and this plugin is well worth trying out to see if you can direct more traffic to your all-important landing page. Leadin is another plugin that is very easy to use. This plugin helps you to find out more about your visitors so that you can improve your lead generation activities. Whenever a visitor submits a form on your website, you can use the plugin to find out the pages they have visited, their social networks, when they return to your site and more. This is a fantastic way to track their behaviour so that you can find out more information about your visitors. It works by using cookies to track their behaviour anonymously, and you can then see a contact record that contains their history so you can get all the information you need to make decisions regarding your marketing. All these plugins are very useful,thanks a lot for sharing it.